BMP is a graphics format used commonly as a simple graphics file format on Microsoft Windows platform. Sometimes it is called DIB which stands for device-independent bitmap. BMP files are not used for transferring images on the Internet or other slow or capacity-limited media because they are too large and not typically compressed. For example an 800x600 image occupies nearly 1.5 megabytes. However this format it quite commen due to its simplicity and widespread familiarity in MS Windows. Besides it's free of patents and well-documented. If you want to convert BMP files to ther formats like TIFF, JPEG, PNG, PCD, etc. 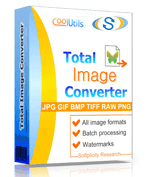 use Total Image Converter. It converts BMP images in batch and offers a lot of handy options (resizing, rotating, adding watermarks). Download your free copy now.